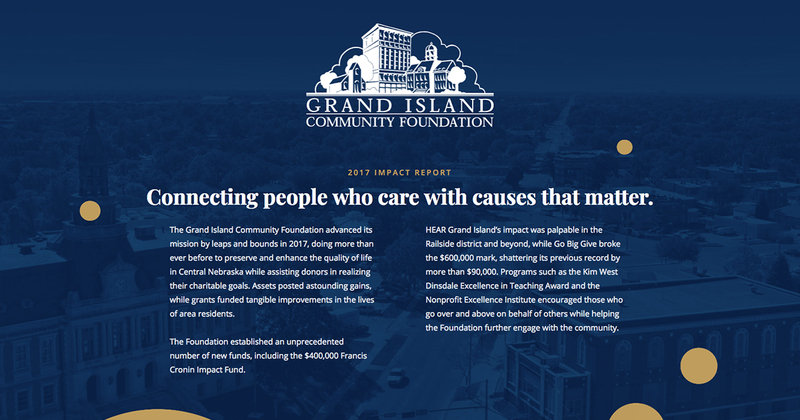 The Grand Island Community Foundation is a growing legacy, not of a single person, but of the entire community. 2017 Impact Report. Learn more about our great year. Define Your Legacy. Find out how to start a fund. Excellence Institute. Learn about our non-profit program. You can make a deep and lasting impact. The Grand Island Community Foundation is a growing legacy, not of a single person, but of the entire community. It is, in a very real sense, the community's foundation. Under one organizational roof, it unites donors, large and small who want to make our community a better place for all. The mission of the Grand Island Community Foundation is to preserve and enhance the quality of life in Central Nebraska and assist donors in realizing their charitable goals. The Grand Island Community Foundation is accredited by the Community Foundations National Standards Board and has been confirmed in compliance since 2009. Spend some time with our annual report. 2017 was a great year, and the momentum is building as we head into the future! Support the foundation and your community at these events.